The MX80 Internet router integrates carrier Ethernet capabilities and a Modular Port Concentrator (MPC) design to create a cost-effective Ethernet service solution ideal for environments with severely limited space. Juniper Networks MX80 Internet router is the most compact member of the MX series product family. Only 2 RU high and equipped with front end accessible redundant power supplies and fans, this platform is perfectly suited for environments requiring full Ethernet capabilities, but facing space or power constraints. In addition to four embedded 10 Gigabit Ethernet ports, the MX80 leverages the technology used in the Modular Port Concentrators (MPCs), common across the MX series, and can accommodate multiple combinations of Modular Interface cards (MICs) for increased flexibility. In the enterprise, the MX80 can be deployed in campus, small sites and small data center WAN connectivity; and service providers can utilize the MX80 for mobile backhaul hub site aggregation, metro ring access nodes, cable and Multitenant Unit (MTU) aggregation, distributed PE and high-end CPE. Our FREE juniper Expert Consultancy Support is over the phone, by chat, by email or by login remotely. 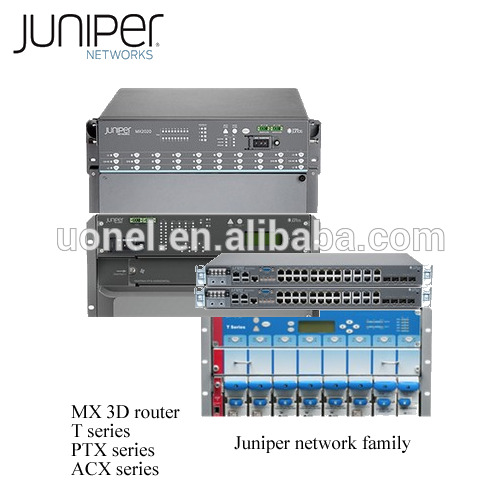 Uonel is one of the biggest juniper Network Hardware distributor in china, founded in 2008. We are a global provider of netwotking products with more than 5000 customers. We provide original new Huawei Routers,Switches,Firewalls,Wireless APs & controllers,OLTs,GPON modems,optical transceivers.Our company have more than $5million juniper products in stock. Most of our technical engineers had work exprience in juniper company,we can provide network design&planning,configration,troubleshooting,maintenance and training service in world wide. Any request for juniper or any questions for cisco specifications ,please contact me.